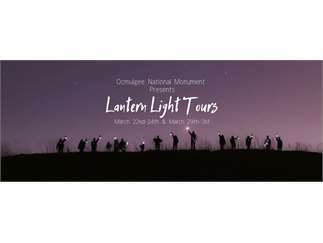 Held yearly during Macon's Cherry Blossom Festival, Ocmulgee National Monument hosts the Lantern Light Tours. Grab a lantern and stroll along the luminary lined path from the Visitor Center to the top of the Great Temple Mound. Join interpretive talks at the bridge, Earth Lodge, Trading Post, and Great Temple Mound sites. Step back in time to meet costumed characters with ties to Ocmulgee's rich history. Learn about the 17,000 year history of Ocmulgee and the people who lived here. Tour the Museum exhibits and 2,000+ artifacts.